three hours of escapist pleasure. For those so inclined, such books still proliferate. But for readers who crave more heft, writers such as the talented Elizabeth George provide literal and literary weight. "This Body of Death," the 16th installment in her series featuring aristocratic Detective Inspector Thomas Lynley of New Scotland Yard, is no exception, as George spins a captivating story in which the past victimizes the guilty and the innocent alike. 2005's "With No One as Witness" signaled a new direction in the series. The publication of "Careless in Red" in 2008 marked Lynley's return - but only because he discovered a body while walking the coast of his native Cornwall in an effort to come to grips with Helen's murder. Now, in "This Body of Death," Lynley is recalled to duty by the new acting superintendent, Isabelle Ardery, who is being given a trial shot at the job Lynley turned down. Ardery, a midlevel character in 1994's "Playing for the Ashes," may not be up to the task. Her position as a woman in a male world is tough enough, but her tendency to take a nip when she's feeling stressed makes her performance even more problematic. Not long after Ardery's arrival, the body of a young woman is discovered in an out-of-the-way London cemetery that doubles as a little-known park. Ardery, knowing she needs help, enlists Lynley to join her team - his old team - and he accepts. But Lynley led by example, Ardery tends toward control, and the team - particularly Detective Sgt. Barbara Havers, Lynley's longtime assistant - bristles under her direction. The victim is identified as Jemima Hastings, a lifelong resident of the New Forest until her breakup with her lover, reclusive thatcher Gordon Jossie, and her sudden move to London. As the cops develop a long list of suspects and interview subjects - among them a self-styled psychic, an environmentally sensitive landlady, a sculptor, an ice-skating instructor, a bartender and a single mom - it becomes clear that the New Forest is inextricably linked to the crime. Meanwhile, George lays out a parallel narrative about the abduction and killing of a toddler by three pre-teens, a story based on the real-life murder of 2-year-old James Patrick Bulger by two children in 1993. George tells both stories in detail, and the reader may begin to see a connection that leads to a tense and tragic solution. As always, her story is credible and commanding, and her characters - particularly Lynley and Havers - continue to evolve while remaining the reader's old and dear friends. gorse was giving way to the creasing purple of heather." her ability to evoke strong emotions. A book for neither the faint of heart nor the short of patience, "This Body of Death" is a rich, unsettling work, one whose darkness is lightened by Lynley's steady emergence from grief. Death may claim its inevitable victory, but the pull of life retains its power in this eloquent affirmation. 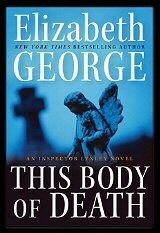 Inspector Lynley is back in this latest installment by Elizabeth George. The question is, is he back for good? The department is still without a superintendent, so Isabelle Ardery has been brought in as a possible candidate. Immediately she has to deal with a murder case. Recognizing that she could use someone to show her the ropes and help her establish trust among her subordinates, she pays a visit to DI Lynley, who agrees to come back to work. A woman has been stabbed to death in a London cemetery. Who is she, and why would someone want to kill her? What's the connection to the New Forest in Hampshire, where Gordon Jossie is a thatcher and where ponies roam free on the common land? And how does the other story fit in, the one interspersed with the present-day action and typed up as if from a psychologist's report? DS Barbara Havers and DS Winston Nkata are on the case in Hampshire while Lynley works with Isabelle in London. Barbara comes across potentially valuable information but can't follow up because Ardery has called them back. It's only one mistake Ardery makes. In fact, she mishandles the investigation in myriad ways, putting her career in jeopardy. She desperately wants the job and Lynley recognizes that she was thrown into it feet first with this huge case, but she may have gone too far. Tensions run high in the incident room, and the wrong man gets accused of murder. Fan favorites Simon St. James and his wife Deborah make appearances in this book, as do Barbara's neighbors Taymullah Azhar and his daughter Hadiyyah. It's these characters and their history with the principal players who really make Elizabeth George's mysteries come alive. Havers and Lynley seem like real people, with lives outside of work and friendships and histories that span decades. This Body of Death is one of George's best as she shows Lynley still dealing with wife Helen's death, and as she introduces Isabelle Ardery and her story, and as she lets the mystery and investigation unfold. New readers may be a little lost and might want to go back and read at least a couple of the first books in the series to get somewhat caught up with the background story, but readers who have followed Lynley and Havers from the beginning will not be disappointed. Definitely get your hands on this book if you like Elizabeth George. In recent years I have come under the thrall of Inspector Thomas Lynley. The high-born Scotland Yard detective sleuths his way through most of Elizabeth George's sixteen novels in the company of a memorable assortment of co-workers and friends - the charismatic Winston Nkata, the obdurate assistant commissioner David Hillier, and the chronically dowdy but ever-compelling Barbara Havers. These all have sprung from the imagination of a former teacher-turned-writer whose Anglophilia and attention to detail take her from her Whidbey Island home to England several times a year so that she might properly research her novels. George's work is so authentic that it has been embraced by the British public and adapted for television by the BBC. And on this side of the pond, we readers are treated to a delicious immersion in English dialects, subcultures, and landscapes. But there is a flip side. George, who has a master's degree in Counseling, is as obsessive about psychological complexities and as she is about physical detail - and readers are confronted with the tawdry and sometimes terrifying workings of her characters' psyches. Such is the case with "This Body of Death," George's brand-new work, as she twines two apparently unrelated crimes through nearly 700 pages of plot. The first story line echoes a real-life crime that occurred in England in 1993, when a toddler was abducted from his mother during a shopping trip, tortured, and murdered by a couple of 10-year-olds who'd been playing hooky from school. Frankly, I found this strand so deeply disturbing that I could scarcely bring myself even to skim it. An Italian mask maker, a schizophrenic street musician, a sage-burning psychic and a doggedly environmentalist landlady are some of the persons of interest in this case that ranges from the countryside to London and back again.Ardery, in over her head, makes disastrous decisions that bog down the investigation, but the department loyalists soldier on and Lynley's mentoring helps to keep things from derailing in this addictive procedural. As always, George weaves in issues of disenfranchisement and conscience. Readers will probably flinch at some of the choices their favorite characters make, but it is precisely that fallibility that keeps us coming back for more. THIS BODY OF DEATH opens with a sterile, stenographic sociologist’s report of a true-life, decades-old murder of a toddler by three young British boys. The tie-in between this horrifying earlier event that emerges throughout the book and the present-day discovery of the body of an unidentified young woman in a London graveyard provides a jigsaw puzzle tantalizingly laid out in its many oddly shaped pieces. Regular readers will read on, confident that Elizabeth George will place them into the picture, but you are left to wonder how they fit until the very end. It is this London murder that has called former Superintendent of Detectives Thomas Lynley back to Scotland Yard from compassionate leave, where he has been walking the Cornish coastline for several months to emotionally recover from the murder of his wife and unborn child. The London Metro office has soldiered on without him, but just barely. When Lynley left, he made it clear he did not want to return to his job as Superintendent, and in fact was uncertain if he wanted to remain in law enforcement at all. with a troubled past, including the discretely hidden but ever-present airline bottles of vodka clinking in her purse next to the breath mints. Lynley’s assessment will carry great weight on her future. Acting Superintendent Ardery gets off on the wrong foot by rankling Lynley’s longtime former partner, Barbara Havers, when she takes Havers’s casual home-cut hairdo and secondhand T-shirts and corduroy pants to task as "unprofessional attire." Havers’s charming nine-year old next-door neighbor girl comes to the rescue for an amusing aside in the lost cause of making over Havers. As Lynley, Havers and Winston Nkata, Havers’s new partner, turn to solving the crime, they discover that the victim is the missing former girlfriend of a professional thatcher who restores the famous thatched roofs in the historic New Forest region of Hampshire. The girl’s brother, who works for the New Forest preserve, believes the former boyfriend is responsible for his sister’s death. Other characters who may have had reason to kill her come into play, offering a fascinating cast of artisans, mystics and buskers who drift between the quaint villages of Hampshire and the London tourist havens. Most of the action is set in the New Forest at the southernmost tip of the heavily populated English coastline. First created by William the Conqueror in 1079 as a deer hunting park, its 200 square miles are dotted with small, quaint villages and most notably populated by its freely roving herds of ponies who graze the heath. Havers and Nkata, big-city coppers with small taste for the wilderness, find themselves in a foreign realm as they search for clues to the murder in the touristy villages and open pastures. Lynley stays behind in London to grapple with the sticky political wicket and to make a major decision about his future at Scotland Yard.